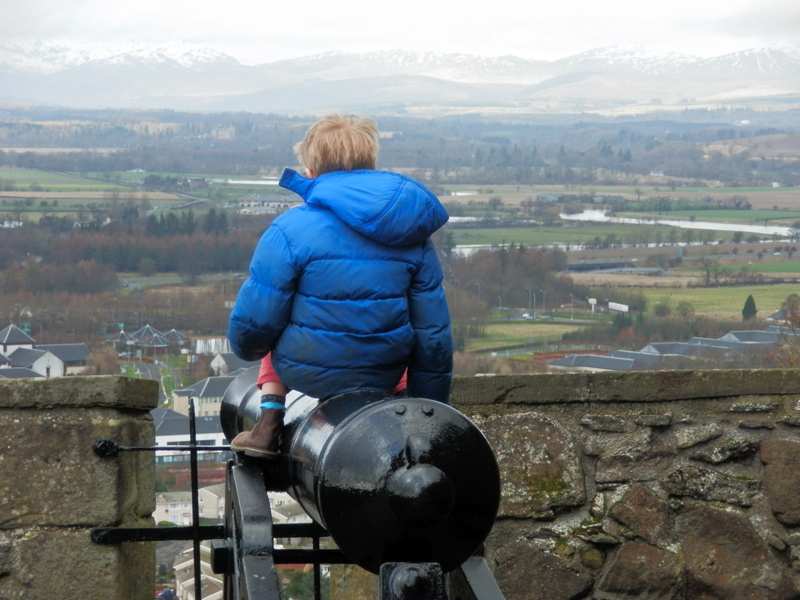 For a half-term treat recently, we met up with Granny for a day out at Stirling Castle. Scotland is stuffed with historic castles, yet this one is really special. You can see the castle miles before you reach it. 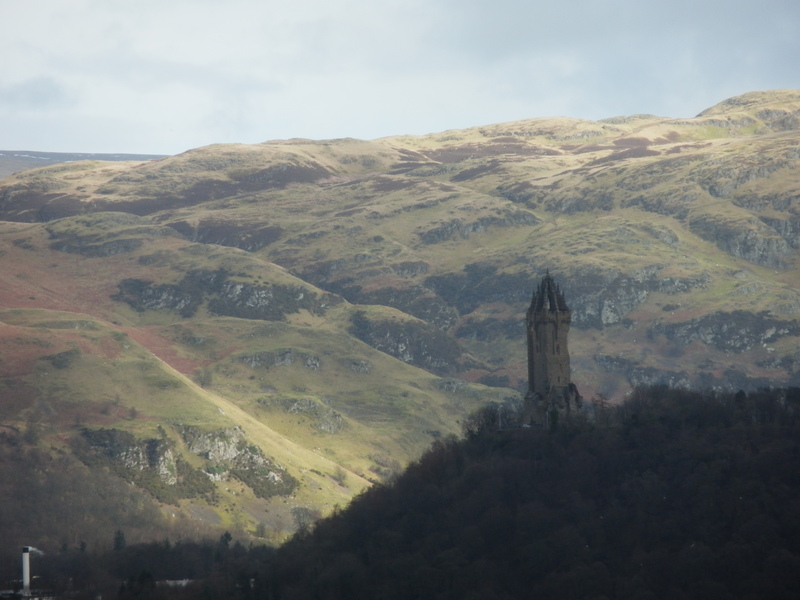 Stirling is everything a Scottish castle might be in your imagination: a grim stone fortress set high on a crag, dominating the plains beneath and set against a backdrop of purple hills. Looking at it, it is easier to imagine armoured knights riding out of it than to believe that any of us are now welcome to enter under its gates. But we are. 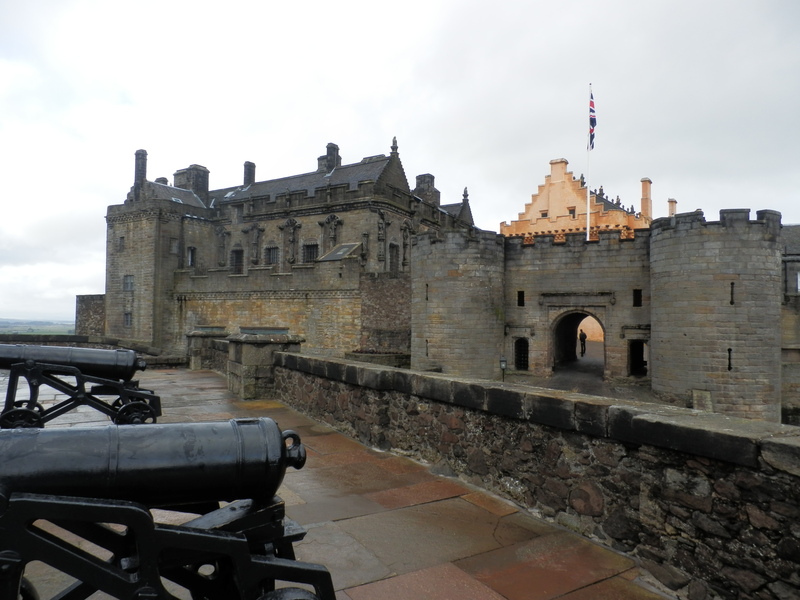 Stirling Castle’s heyday was centuries ago, in the time of the later Stewart kings. After the Union of Crowns in 1603, the royal court moved south and the castle fell gradually out of use, except as a military garrison. Today it is cared for by Historic Scotland, under whose aegis the buildings have been restored and transformed into one of the most memorable places to visit in the country. If you are visiting Scotland as a tourist, do make sure that this castle is on your list! Both in its strategic importance and its grandeur of location, Stirling arguably beats even the castle in Edinburgh. Built, like Edinburgh’s, on a spur of volcanic rock, Stirling Castle rises from boggy flood plains, between rough hills to north and south and the great river Forth meandering west to east. In the long centuries before the marshes were drained and roads were blasted through the hills, whoever controlled Stirling Castle controlled access across the whole of central Scotland. It has been described rather poetically as the brooch pinning Highlands and Lowlands together. No wonder there have been memorable battles fought beneath its walls (Bannockburn, anyone?) and no wonder that the castle is defended by massive walls, bastions and canons. These days the defences are purely historic: the last military threat to face the castle was the Jacobite rising of 1745. The canons remain only for ornament and, of course, for children. Was there ever a child who could set eyes on a canon without feeling the urge to climb aboard? There is plenty to see and do for all ages inside the walls as well. Once you have passed through the several guarded gateways and under the ominous portcullis, a surprise awaits you. The grim fortress you first spotted from afar is, in fact, an elegant palace, ‘arguably the finest complex of late medieval and Renaissance royal buildings in Scotland’. 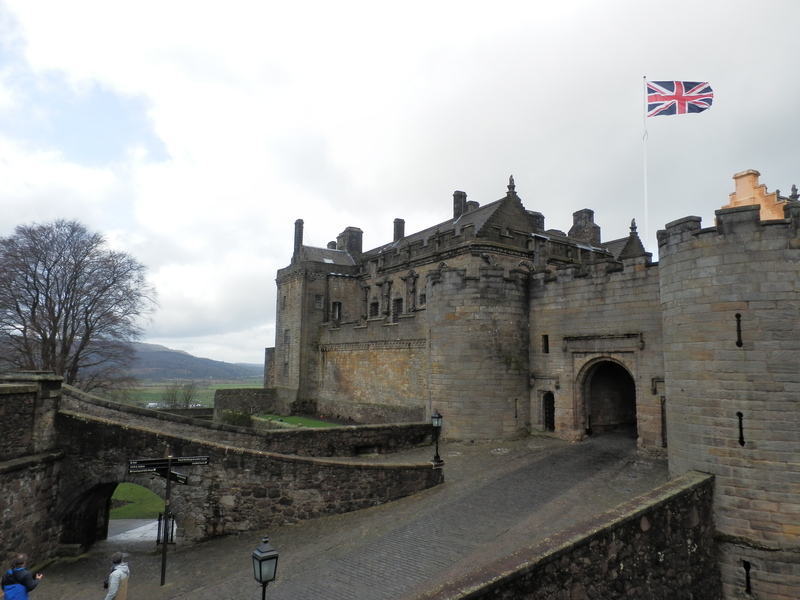 * Although there has been a royal castle at Stirling since the reign of Alexander I in c. 1107, the buildings were heavily altered or replaced by the Stewart kings, culminating in the 1530s with James V’s building of a palace in French style to house his French queen, Mary of Guise. 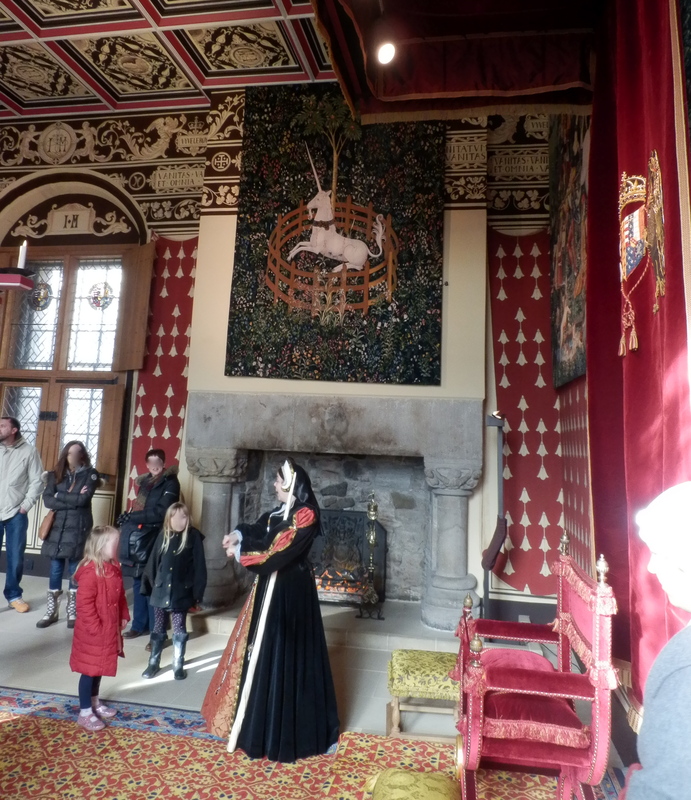 and the Queen’s Inner Hall, on the walls of which hang the famous Unicorn Tapestries. A lady in period costume gossips to visitors about daily life at the court of King James V.
This is my favourite. The unicorn dips his horn in the stream, while peaceful animals look on. Stag and lion, leopard and goldfinch, and a pair of pheasants on the fountain: all is harmony until the hunters burst in. 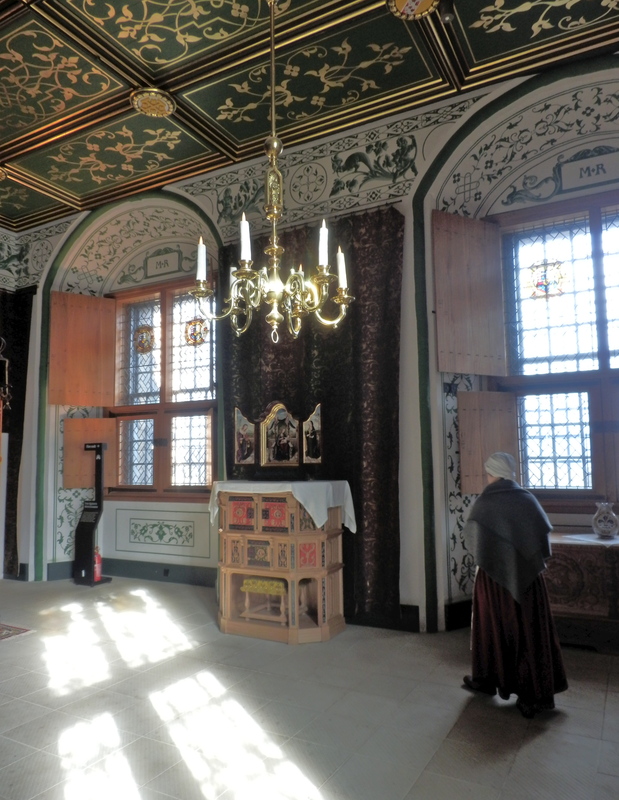 Several smaller rooms have been restored to house entertaining, interactive exhibits about the building of the castle and about courtly life within it. My boys’ favourite was the room about clothing in the era of James V (early 16th Century): there are lots of costumes to try on! I swear the boys grew an inch in stature once they were buttoned into damask doublets and fur-trimmed cloaks. The younger one would happily have made off with a full set to wear back home. ‘Little Lord Fauntleroy’, observed Granny. 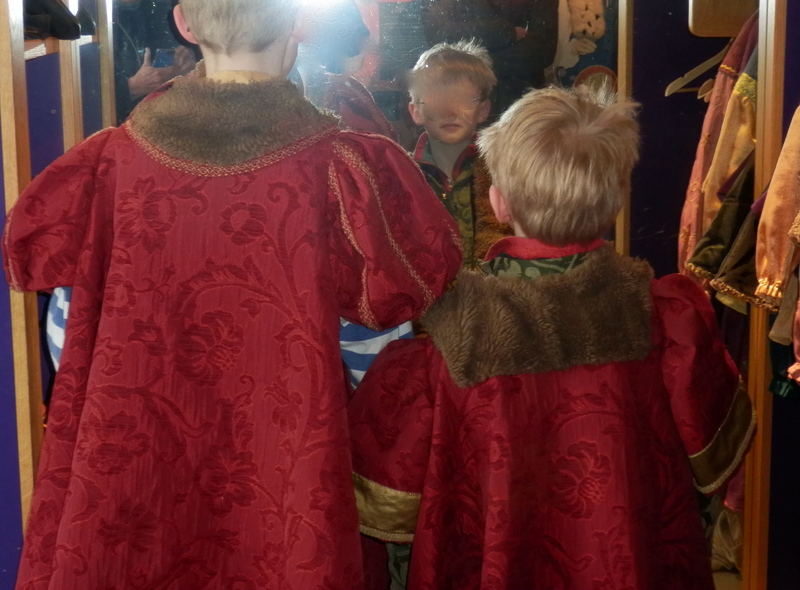 The boys admire their 16th Century selves in a handy mirror. One of the most memorable areas is the kitchen, or rather kitchens. 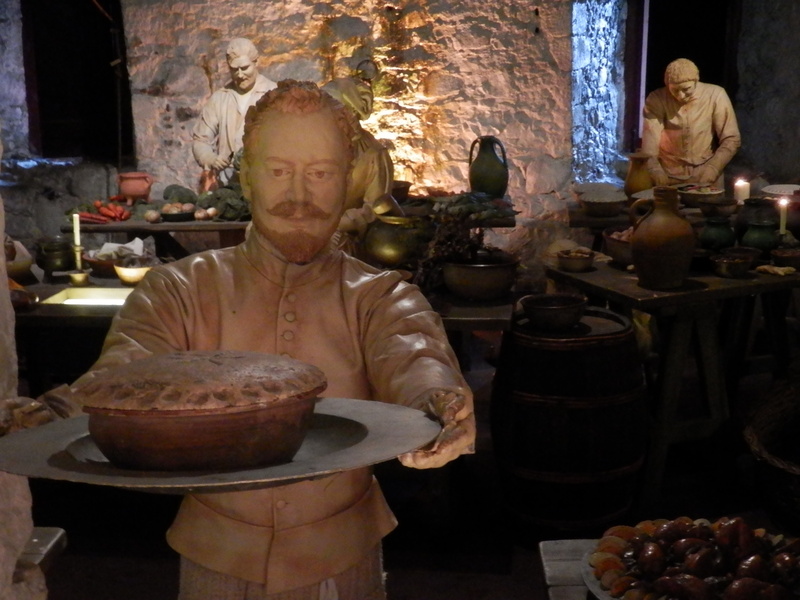 They are populated by a full complement of plaster model cooks and kitchen boys in sixteenth century mode, and stuffed with plaster food fit for a royal feast: mussels, eels and sides of beef, raised pies and roast swan, loaves and bannocks by the dozen. It is very atmospheric, if slightly spooky, as you thread your way between the ghostly workers. To round off your visit, there is a very good cafe tucked into some of the old vaulted rooms nearby – and no, the food is not made of plaster! A final compulsory look in the gift shop finished off a wonderful day for us. This is history brought to life, at levels which every age can enjoy. *The quotation and much of the information in this post is taken from ‘Stirling Castle’ by Richard Fawcett, Principal Inspector of Ancient Monuments (Historic Scotland, 1999). 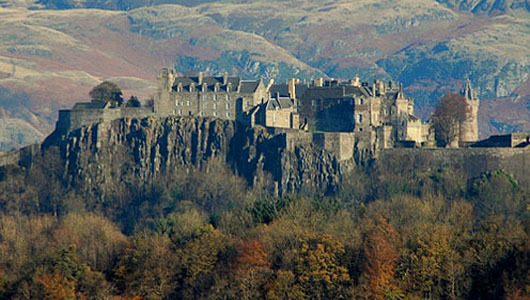 You can find good information online at the official website for Stirling Castle. You might enjoy A poem for Bannockburn, and a short piece about Carlisle Castle: Now THIS is a castle. Stirling is a rather wonderful castle, especially since the recent restoration. Ah yes, the referendum. You mentioned BC in your comment on my blog – it’s on our list of places to escape to permanently if the referendum goes the wrong way. However given the extent of cyber-venom at the moment towards those who express the ‘wrong’ opinion, I’m not revealing what I think the ‘wrong’ way is. I’ve been there twice now, but seeing your photos and reading your descriptions makes me want to go there again! Stirling should be on everyone’s itinerary when they’re visiting Scotland. Wouldn’t it be wonderful to see it as it was in the days of James IV and V, with the tall entrance turrets? 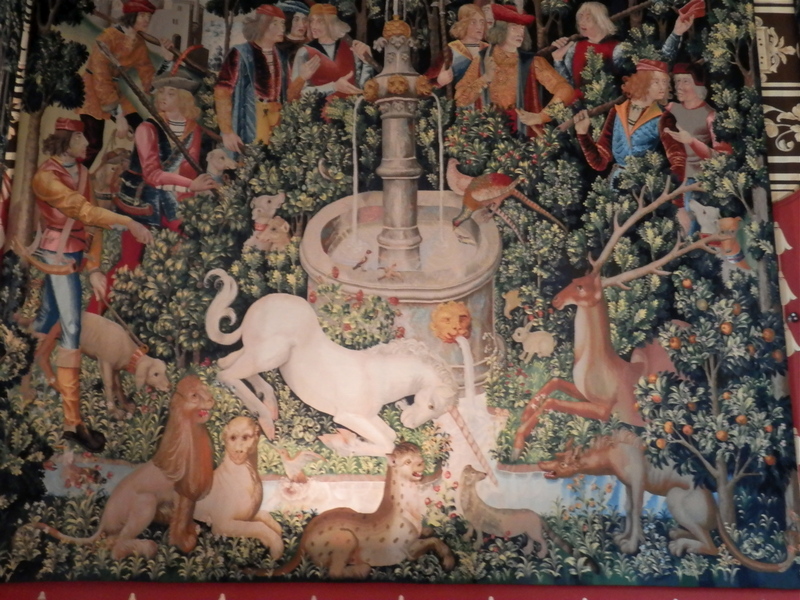 I think the Unicorn tapestries are just beautiful – the Unicorn has a real presence. Lovely post – thank you! Thank you, Jo. It really is a wonderful place. I agree that the Unicorn has such presence – and yes, I too yearn for the chance to have seen the castle with its pointy roofs on, like a chateau from the ‘Tres Riches Heures’ of the Duke of Berry. How many children throughout history have sat on a cannon on those walls looking over the lands. Just a beautiful post. I’ve read about this castle so much in novels/history I really want to see it in person. A lovely brooch indeed. Will be watching that vote. Really glad you enjoyed hearing more about it all. You will, of course, be welcome in Scotland whatever the outcome of the Referendum! I almost feel like it’s blasphemous to say, but I like Stirling Castle better than Edinburgh too. I think that Edinburgh Castle is fantastic, but it feels like a monument, whereas Stirling is such a historic touchstone. It just gives off a different “vibe”. Thanks for sharing all of your beautiful photos! That’s exactly it, you’ve got it. 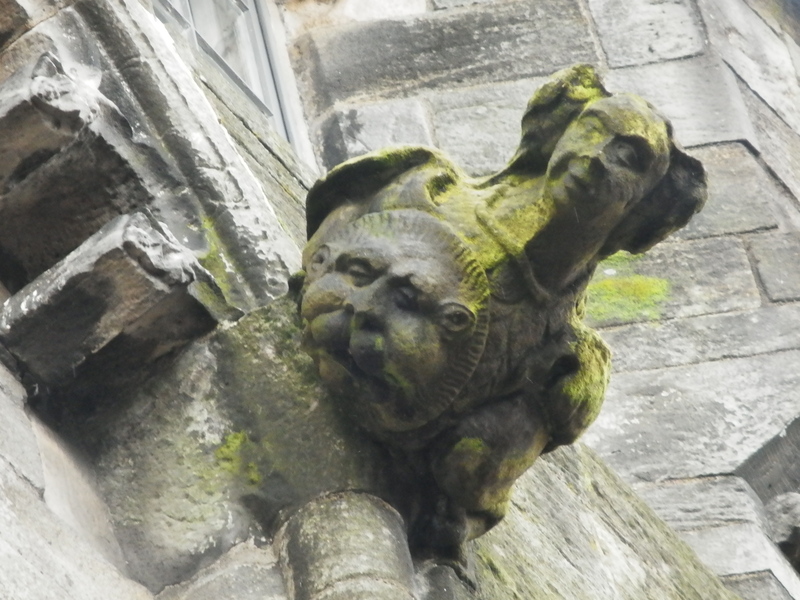 Stirling is a historical touchstone. We took the boys to Edinburgh Castle a couple of years ago and I’m ashamed to say that I can barely remember a thing except for Mons Meg (the great canon) and lovely little St. Margaret’s Chapel. Everything else has been superimposed with Stirling! And children can dress up ? Nice. Thank you for sharing this rich historical post. Once again you tempt me to flee my office, retrieve my husband from his, drive to the airport without saying a word, and get on a plane to Scotland. Fortunately your post is so rich both photo in and descriptive prose to save me from such an impulsive decision. 🙂 Thank you for providing a wonderful “tour” of the castle, DB. I will indeed put Stirling on the list when — not if, but when! — I make it back to Scotland.